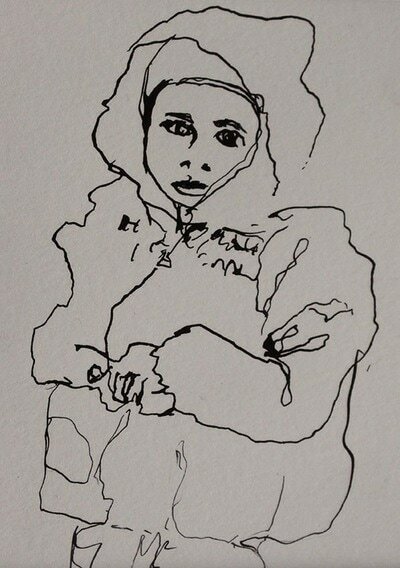 an exhibition of paintings and sketches by Alex Hain. There must be oil, acrylic and pencil lead flowing through the veins of Alex Hain as both his parents went to Art College – he shares a studio with his father, Rob Hain, who specialises in colourful, animation-style prints of Scottish scenes. Alex is clearly a talented, refreshingly exciting, young artist from the Scottish Borders with quirky, comical observations on today’s cool, contemporary Youth “Yoof” culture. 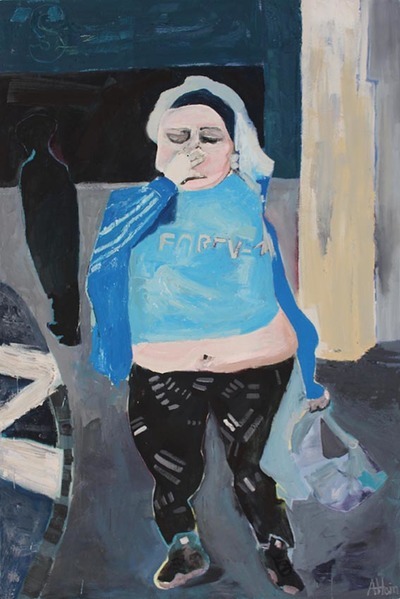 This exhibition, entitled Post-Truth (Word of the Year 2016 and Trump’s fave saying), is an interlinked series of portraits and figurative studies, illustrating the global craze of the Selfie in oil on canvas. Here is the twittering, symbolic, shorthand manner of communication through #hashtag, SnapChat and Instagram, where today’s teenagers share, by text and photograph, the most intimate details of their life and loves on social media. 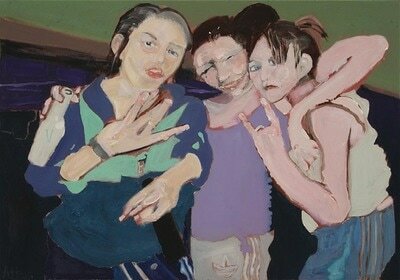 Walk around the Dundas Street Gallery to observe a truthful snapshot of the new kids on the block, wild girls out on a Saturday night, cheeky chavs with their back-to-front baseball caps and hoodies, and brash, street wise guys partying down the pub, drinks in hand. 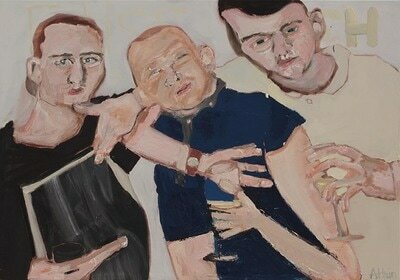 There’s a great sense of filmic movement and energy in such works as “#Lads,” three guys showing off with gleeful gestures and grimaces, and three blondes as high kicking clubbers, posing for the camera lens in the Ladies Loos. 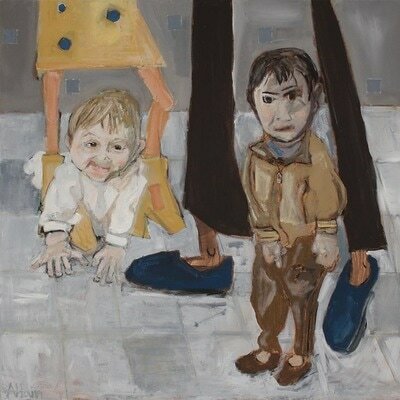 Subjects range from the playful to the political: as well as these vibrant oil paintings depicting the fun and frolics of modern social life, there are simple, black and white caricatures such as “#Jungle”, showing the fear and confusion on the face of a migrant child, perhaps at the Calais camp. “#Legs” shows the tall, skinny limbs of (faceless) migrant parents with their two tiny toddlers, staying close to Mum and Dad. Their slightly distorted facial features reflect a sense of sadness and loss in this new alien environment, far from home. “I like the friendliness of the back streets, which mean almost entirely screaming, playing children … the noise of children”. 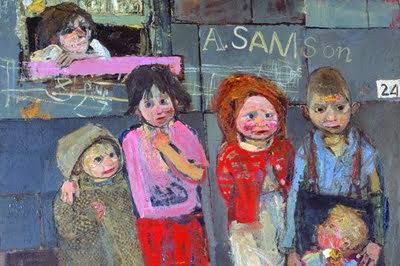 She concentrated on drawing the large Samson family (12 children) focusing on their hand-me-down clothes, cross-eyed girls with messy hair, as well as the urban squalor of this neighbourhood, living in slum tenements with graffiti walls. Alex is also fascinated by capturing an incisive glimpse of today’s cool kids whose behaviour, looks and language are led by the fast changing, Internet-driven, global life and times of the Millennial generation. 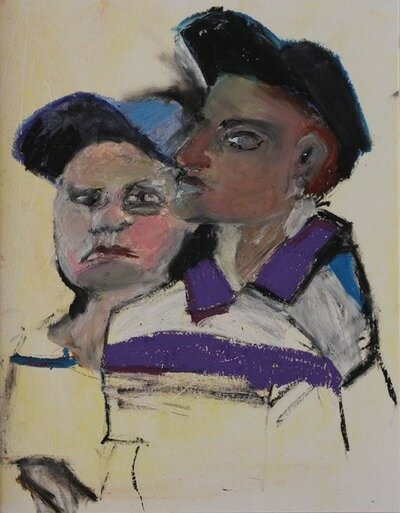 This is a bold, unique painterly vision and, like Eardley, Hain is a true social commentator through his art. If there was an urban pop soundtrack to this inner city lifestyle, it would be a rousing, raucous rap by Tinie Tempah, Will.i.am or Eminem: perhaps a flavour of hip hop, gangsta tunes could be played in the gallery to capture the musical mood and beat of the street.